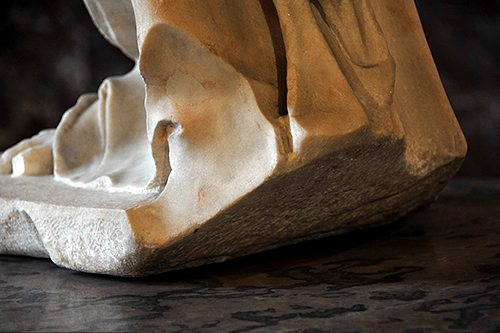 Part of the original plinth on which the Venus de Milo stood was lost soon after it arrived at the Louvre in 1821. Its appearance can be discerned, however, from a sketch made that year at the request of Jacques-Louis David. It was used as the frontispiece of a paper by the Comte de Clarac, in which he insisted that the statue was by Alexandros of Antioch, whose name was inscribed on the missing section as having made it. 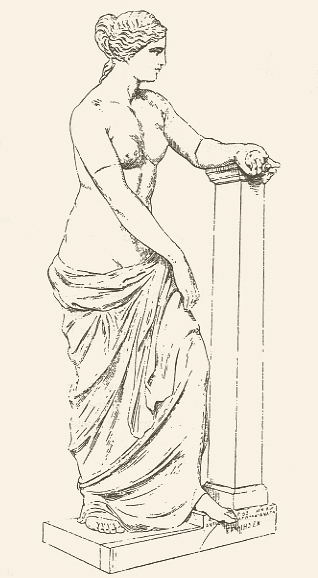 The original drawing by Debay is not quite as refined as the illustration above, which presents a more muscular Venus and adds a dotted line across the hips to indicate where the two blocks of marble were joined. The upper left arm already has been tentatively restored; the missing right arm, which had been sculpted separately, was supported by a dowel below the right breast and joined just below the breakage point. 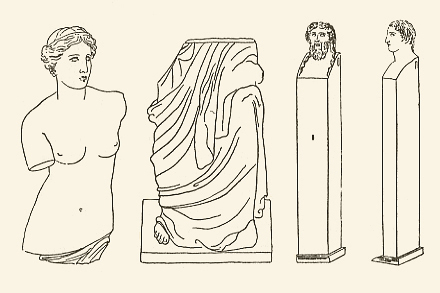 The first sketches of the Venus de Milo (left) were drawn at the find site by Voutier when it first was discovered. It can be seen that the statue has been sculpted in two pieces. The missing section of the draped right hip soon was found and, when slid between the two larger blocks, allowed the statue to be seen by Voutier essentially as it is now. The two herms found at the time also were illustrated, both sitting on their bases, the inscriptions of which were drawn clearly enough to be read. The beardless head on the fractured base represents Hercules; the bearded one, Hermes. Their identity can be ascertained from an inscription that surmounted the entrance of the niche where the Venus was found. The dedications of the exedra and the herms had been transcribed by d'Urville and copied by Clarac at the Louvre before this stone, too, was lost. The letterforms of both the dedication and the missing base suggest a date c.150-50 BC. In self-imposed exiled after the restoration of the king, Jacques-Louis David was France's pre-eminent neoclassicist painter. He was intrigued by the Louvre's new acquisition and asked that a drawing be sent. The request was made to a former student who then was the curator in charge of antique restorations at the museum, who charged his young son Auguste Debay with the task. This detail (right) was drawn when the two fragments of the base still were fitted together. A tracing was sent to David and the original retained by the boy's father, to be used later by Clarac for his pamphlet and of which the Comte de Forbin, director of the Louvre, apparently was completely unaware. Voutier had copied the inscription on the base of the bearded Hermes incorrectly, repeating two of the letters. The mistake was realized when a Hellenistic statue of Poseidon, very similar to the Venus and possibly by the same sculptor, was found on Melos in 1877 together with several others, one of which was inscribed "Theodoridas son of Laistratos to Poseidon." Then, in 1900, almost eighty years after the base of the Hermes had arrived at the Louvre, it was rediscovered and found to fit perfectly with the herm. Both the Hermes and the Poseidon had been dedicated by the same person. 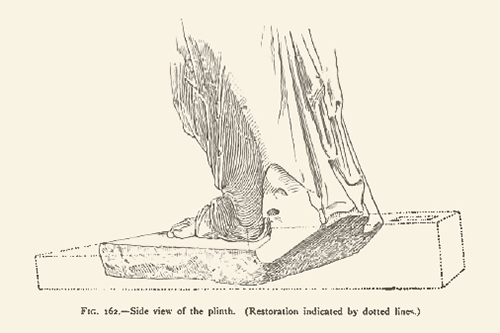 This illustration (left) from Adolf Furtwängler provides a different perspective of the fractured plinth. The left foot of the Venus, which was sculpted separately, rested on the higher wedge-shaped slab and projected beyond it. Joined together, it would have made the front of the plinth square with its other sides, as indicated by dotted lines, and may be why the artist confined his inscription to the lost portion of the base. The photograph shows the base of the Venus as it now appears. Furtwängler believed that the inscribed base belonged to the statue of Venus; indeed, its disappearance was "only a proof of its genuineness. It was an awkward witness, and had to be quietly got out of the way," as the missing fragment demonstrated the statue to be a Hellenistic work rather than by Praxiteles. Given the square hole in the plinth, he reconstructed the figure with the left arm resting on a pillar or stele, the hand holding out an apple in its upturned palm. Here, the arm is presented as being bent forward and not upward, as shown in Debay's drawing. 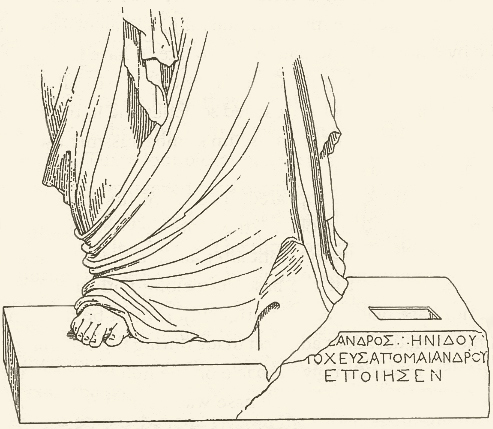 Even though fragments of such a column never were found and Voutier's drawing clearly shows that the herm of Hercules stood on its inscribed base, the placement next to the Venus was, for Furtwängler, an aesthetic impossibility. "The artistic effect produced by a conjunction of statue and term is distinctly unpleasing....It would moreover be not only a hideous but an unparalleled device to place a term as support to a figure with which it had no definite connexion." Consequently, he presented the arm of the Venus supported by a simple column and not the herm. To be sure, the Venus standing next to an undistinguished herm of Hercules half the size does seem an awkward composition. But this must have been exactly its appearance. It is a salutary reminder that ancient and modern aesthetics are not necessarily the same. Rather than "herm" (from Hermes), Furtwängler used the more antiquated word "term," which the Oxford English Dictionary defines as a statue or bust like that of the god Terminus, in which only the upper part of the body is represented, terminating below in a pillar or pedestal that bears the figure. 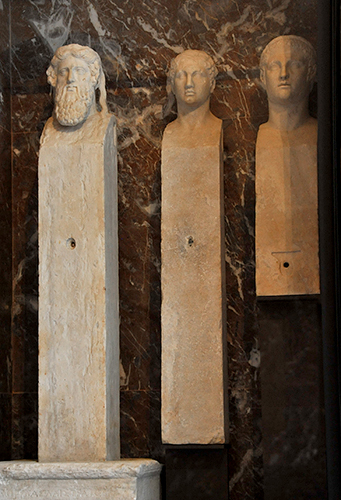 Here, displayed with additional fragments that were found at the site, including the left hand holding an apple, is the herm of Hercules (middle), which is missing its base. 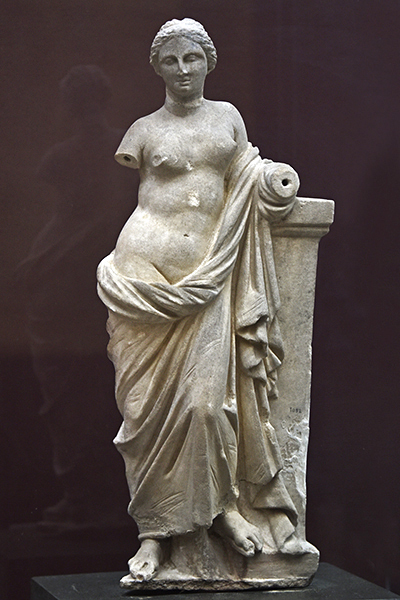 This small marble statuette of Aphrodite (right) in the Archaeological Museums of Istanbul shows to better effect how the base of the Venus might have appeared. Found at Priene in western Turkey, it dates to the second or third century BC. The French archeologist Salomon Reinach was a contemporary of Furtwängler and his fierce rival, who continued to insist that the Venus had been sculpted in the fourth century BC and not the second, as its inscribed base demonstrated. A brilliant scholar, he also was obsessively fascinated with the tormented British poet Pauline Tarn (who wrote in French as Renée Vivien) and her American lover, the heiress Natalie Barney who hosted a literary salon in Paris and also had a passionate affair with the beautiful demimonde Liane de Pougy and later a devoted relationship, lasting more than fifty years, with the American painter Romaine Brooks. To the erotically confused Reinach, all this was catnip. 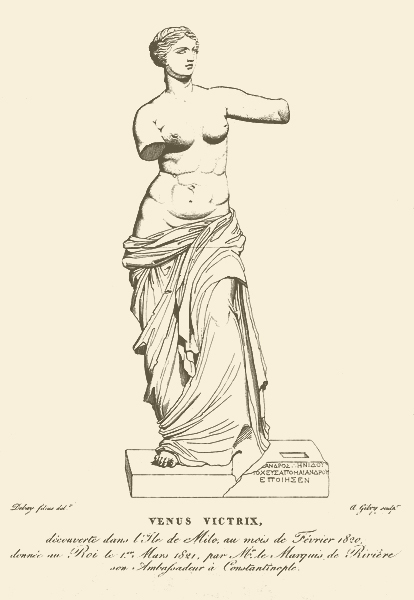 References: Disarmed: The Story of the Venus de Milo (2003) by Gregory Curtis (a very satisfying read); Masterpieces of Greek Sculpture (1895) by Adolf Furtwängler and edited by Eugénie Sellers.